Saturday, April 27th 9:00 a.m.- 8:00 p.m.
Sunday, April 28th 12:00 p.m.-4:00 p.m. 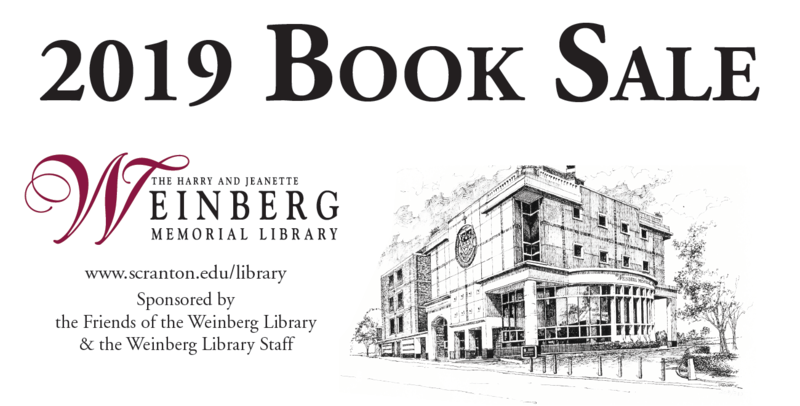 The Friends of the Weinberg Memorial Library book sale is almost here. Volunteers, faculty, and staff are preparing for our annual sale, which supports our collections and services. 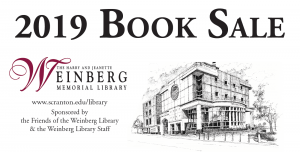 The event is the last weekend of April with a special preview sale for current Friends of the Library & Schemel members and University of Scranton students on Friday, April 26 from 4-8 p.m. Join the organization if you would like to take advantage of the special preview. Click here for membership information. The library will accept any hardcover or paperback books in good condition, including children’s books, cookbooks, fiction, and non-fiction. In addition, the library is collecting media and tag sale items. Donation boxes are in the main entrance of the library. Ask at the circulation desk if you require assistance or contact Barb at the number below. For additional information or to volunteer, please contact Barb Evans at 570-941-4078.